As 2018 draws to a close, it’s once again time to publish the fifth annual LetsRun.com world and US rankings. From now until the end of the year, we’ll be ranking the top 10 men and women in the world (plus the top five Americans) in the 800, 1500/mile, 3000 steeplechase, 3,000/5,000, and marathon. An emphasis on performance in big races. Obviously there was no global outdoor championship in 2018, but meets like the Diamond League finals, World Indoors and, in the case of the US rankings, USATF Championships, will factor heavily in the rankings. Performance in regular-season Diamond League meets is also an important factor. Season-best times matter, and if an athlete has a bunch of fast performances, they’re more likely to be ranked highly. Runners who specialized in one event will be considered for other events but can be penalized in the rankings for not running enough races. Indoor races will be considered and can help an athlete’s ranking. Laura Muir had herself quite the 2018 season. In March, she snagged two medals at World Indoors — the first global medals of her career (silver in 1500, bronze in 3000) — after snow in the UK caused her to take a six-hour, 300-mile taxi ride to the meet from her home in Glasgow. In May, she passed her final exams to become a vet. And in August, she won her first European outdoor title, her second Diamond League title, and became the only woman to break 3:59 three times in 2018. Muir has been among the best in the world for some time (#5, #2, #4 in our world rankings the last three years), but her tactical improvements took her to a new level in 2018. It’s not that Muir was running like a fool in 2016 or 2017, when she was in position to medal at the Olympics and Worlds before fading over the final 200. But in both races, Muir ran aggressively for gold, which got her into trouble when she tried to respond to moves by Faith Kipyegon that she simply could not match. This year, Muir ran a lot more like Jenny Simpson, who has earned a pile of medals by tuning out the big moves and simply trying to get to the finish line as fast as possible. The result was a silver at World Indoors and a perfectly-measured upset win over Shelby Houlihan at the Diamond League final. And a World #1 ranking from LetsRun.com. Of course, the fact that Kipyegon was out pregnant and Genzebe Dibaba wasn’t in the biggest outdoor 1500s of the year, made it easier for Muir to run smarter tactically. Picking between Houlihan and Hassan was extraordinarily difficult as they have near-identical resumes. Both won two Diamond Leagues, their season bests’ were just .07 apart (Hassan’s was her 1500 split from her 4:14.71 mile in London), and they never finished more than one spot apart in their three head-to-head matchups. While Houlihan led those head to heads 2-1, we put Hassan at #2 as she prevailed at World Indoors (earning bronze, Houlihan was 4th – while Houlihan came out on top in their biggest outdoor meeting (second at the DL final, though Hassan was doubling back from a brutal 5000 in Zurich the night before)) and because her 4:14.71 mile in London converts to a 3:55.80 1500 which is a lot faster than Houlihan’s 3:57.34 sb. For years, Jenny Simpson has sat on top of the US 1500 rankings, with a final 100 meters that few runners anywhere had an answer for. That certainly changed in 2018. Houlihan didn’t just beat Simpson in 2018; she blew her away, with her margins of victory in their three meetings increasing each time, from .31 at the Pre Classic to .73 at USAs to a humongous 5.63 seconds at the DL final in Brussels. Simpson remains world-class; Houlihan was simply better this year. 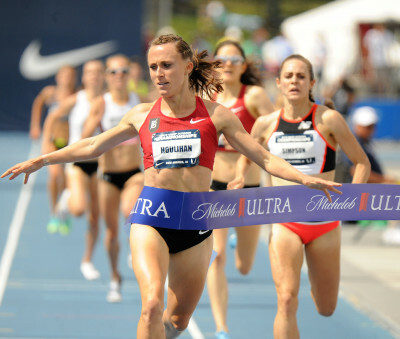 Houlihan was far from anonymous in the US prior to 2018, making the Olympic final in 2016 and the World Championship final after winning USAs in 2017, both at 5,000 meters. But she reached an entirely different level in 2018 as she was able to marry the speed that inspired her Twitter handle (@shelbo800; stop asking about it, she’s not changing it) with the strength that came with three healthy years of training under coach Jerry Schumacher. The result was one of the greatest seasons ever by an American female on the track, with four US titles (1500/3000 indoors, 1500/5000 outdoors), two Diamond League victories, a 3:57.34 1500 pb (#4 all-time US), and an American record of 14:34.45 in the 5000. There’s a case to be made for Dibaba as World #1 considering she ran the world-leading time of 3:56.68 outdoors and won the World Indoor title in Birmingham in commanding fashion. But to do so would be to reward Dibaba for dodging her competition in the Diamond League and running races in places like Chorzow, Székesfehérvár, and Padua instead of Stockholm, Lausanne, and Brussels. To be fair to Dibaba, she did run three Diamond League 5,000s. If that’s the event she wanted to focus on outdoors, then so be it. We can’t fault her for choosing to run the 5,000 at the Diamond League final in Zurich over the 1500 at the Diamond League final in Brussels the next day (even though Sifan Hassan managed to run both races). But for Dibaba to run a world-leading 3:56 in Chorzow, Poland, on June 8 (a race she won by eight seconds) instead of the Diamond League 1500 in Stockholm two days later is absurd. Same goes for her running a 4:24 mile in Székesfehérvár, Hungary, on July 2 (a race she won by four seconds) instead of the Diamond League 1500 in Lausanne three days later. We value wins over strong competition over putting up fast times against nobodies. Dibaba belongs on this list because of her dominant World Indoor title, but it’s difficult to grade her relative to her peers outdoors when she wouldn’t face them on the track. Tsegay earned a reputation for fierce front-running in 2018 and was never bolder than she was in Stockholm, where, rather than let rabbit Noelie Yarigo go when she came through 400 in 59.96, she chose to give chase, running splits of 60.7 and 2:05.4 for her first 400 and 800, respectively, and holding on for a two-second PR of 3:57.64. That allowed her to stun Laura Muir and claim her first career Diamond League victory, in much the same way that Muir stunned Faith Kipyegon to earn her first DL win in Oslo three years earlier. 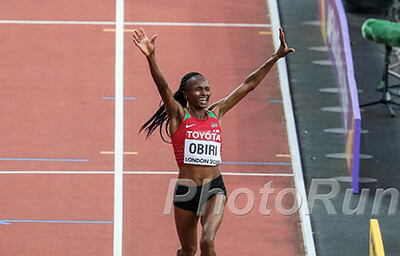 The victories stopped once opponents got wise to Tsegay’s style, but she still put together a fine season, finishing in the top four in all five of her DL appearances and breaking 4:00 four times after having done it just once in her career before 2018. For most of the season, Chebet was a step behind the Muirs, Houlihans, and Hassans of the world, but the Kenyan put together a solid year overall and closed it out in style, beating Houlihan at her own game by using a stellar 56.2 final 400 to win the Continental Cup. At the senior level, Chebet has yet to make a global outdoor final (she was a semifinalist in the 800 in 2013 and in the 1500 in 2016 and 2017), and still has to improve her consistency (8th in Lausanne and 10th in Doha were not great results). But as her run at the Continental Cup in September and her third-place finish in the DL final showed last year, when she’s on her game, Chebet is capable of contending with the world’s best. Over the past two years, Chebet’s Rongai Athletics Club teammates Timothy Cheruiyot and Elijah Manangoi have conquered men’s 1500 running under their coach Bernard Ouma. Can Chebet join them on the global podium in 2019? Semenya’s main event is the 800, but she is so laughably dominant over two laps that in recent years she’s experimented with both the 400 (where she won the Diamond League final in 2016) and the 1500 (where she medalled at Worlds last year). She only raced the 1500 once after May 4 but what she accomplished this year — winning the Commonwealth title and clocking a South African record of 3:59.92 to win the Diamond League opener in Doha — is enough for her to crack the top 10 in our rankings. Running the 1500 at least shows that Semenya is mortal. While her range is absolutely ridiculous — it will be quite some time before another woman runs sub-50 in the 400 and sub-4:00 in the 1500 in the same year, as Semenya did in 2018 — she was not invincible, as she is in the 800. We discovered that in Lausanne, where Semenya suffered her first defeat of 2018 over any distance. Semenya went with the leaders, was still there with 200 to go, but simply could not hold on in a 3:57 race won by Shelby Houlihan. Still, Semenya’s speed means that she will remain a factor in championship 1500s moving forward — assuming she is still allowed to compete in 2019 and beyond. Arafi put together a career year in 2018, running PRs in the 800 (1:57.47) and 1500 (3:59.15) and even running a leg on Morocco’s national-record-setting 4×400 relay at the Mediterranean Games. Though she never finished higher than third in a DL, she proved herself capable every time out and had a 2-1 record against American Jenny Simpson, whom she edged out for the #8 spot in our rankings. In the five years we’ve been doing our rankings, this was the lowest that Simpson has ranked, which can be viewed in one of two ways (and both may be true): that, at 32, Simpson may be losing her fastball; and that, if ninth in the world represents a “down” year, Simpson has been damn near exceptional over the past four (and that doesn’t even include her 2013 season, the last before our rankings began, in which she snagged a silver at Worlds). It is a fact that most 1500 runners begin to decline after the age of 30, and perhaps, after medalling at the Olympics in 2016 and Worlds in 2017, that is starting to come true for Simpson, who recorded her lowest finish at the Diamond League final (10th) since 2011. But it is also true that Simpson is at her best at the major championships, and because she didn’t run a full indoor season, she did not get a chance to prove herself at one of those in 2018. Simpson’s top two times this year (3:59.37 and 4:00.34) were both faster than her 2017 season best of 4:00.70, and her 4:17.30 mile in London converts to a 3:58.20 1500 and put her 11th on the world all-time list and represented the fastest by an American woman in 33 years. Oh, and she won her seventh title (and sixth consecutive) at the Fifth Avenue Mile. If she’s beginning to slip, it’s not by much. Simpson will be 33 by the time of the 2019 Worlds in Doha, and no woman that old has medalled in the 1500 at Worlds since Russian doper Olga Yegorova in 2005. It will be a tough task, especially with reigning champ Faith Kipyegon of Kenya expected to return from her pregnancy break. But Simpson has run four World Championships since 2011, and in the three in which she finished the race with two shoes, she has come away with a medal. We would hesitate writing her off for Doha. Better known in 2018 for her steeplechase exploits, where she ran an unfathomable 8:44 world record in Monaco, Chepkoech only ran the 1500 once after April 10, finishing ninth at the Pre Classic. But before then, she put up a 4:02.21 Kenyan national record indoors (almost two seconds faster than everyone else in 2018, outside of Dibaba), finished seventh at World Indoors, and claimed the silver at Commonwealths behind Semenya. 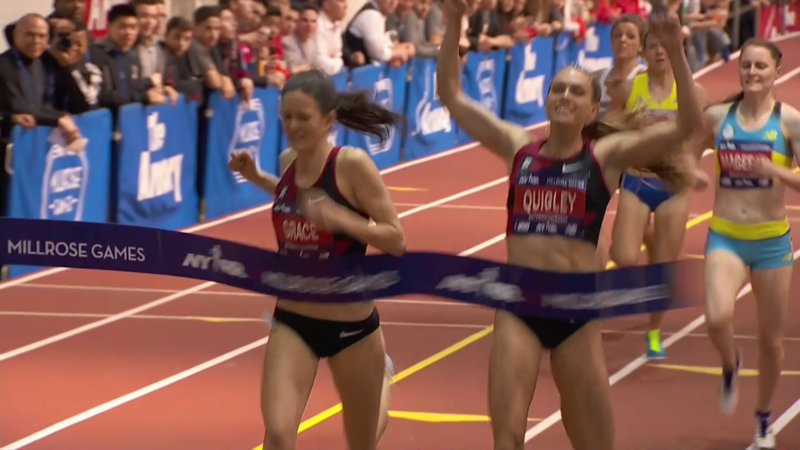 Quigley missed a good chunk of the outdoor season due to injury — she didn’t race from April 20 until July 20 — but when she was healthy, the steeplechase specialist was very good at the shorter event. It began with a Wanamaker Mile title at Millrose, where she prevailed in a tight race, and continued with a runner-up finish at USA Indoors (behind only the irrepressible Houlihan) and a ninth-place finish at World Indoors. Outdoors, Quigley ran just one European 1500, but it was a good one as she set a 4:03.02 pb in Chorzow, Poland, in August, the #4 time by an American this year. We did consider Quigley’s BTC teammate Kate Grace in this spot as Grace was third at USA Outdoors while Quigley was sidelined due to injury. But Quigley was 4-0 against Grace in 1500/miles this year, which means we have to rank Quigley ahead. 2018 was Grace’s first season under coach Jerry Schumacher. And early on, she admitted, it was a challenge. Though she came just a step away from winning Millrose, she was just 10th at USA Indoors (though it didn’t help that she got sick the week before the race). But Grace didn’t join BTC for a quick fix; she joined in the hopes of taking her from a world-class runner (Olympic 800 final in ’16, World Championship 1500 semis in ’17) to a global medal threat, and the Yale grad understands that that process can take time. 2019 will be the true test to see whether joining BTC was the right decision. Picking the #5 spot was a lot tougher than the top four, but we ultimately went with Martinez, who ran significantly faster than the other serious contenders (Shannon Osika, Rachel Schneider) and was unlucky to be clipped at USAs with 200 meters to go for the second time in three years (she wound up falling to the ground and dropping out of the race). Her 4:02.65 at the Pre Classic ranked her third in the U.S. this year, and while she was only 11th and 13th in her other two Diamond League events, she did run a solid 4:06.54 in Stockholm.